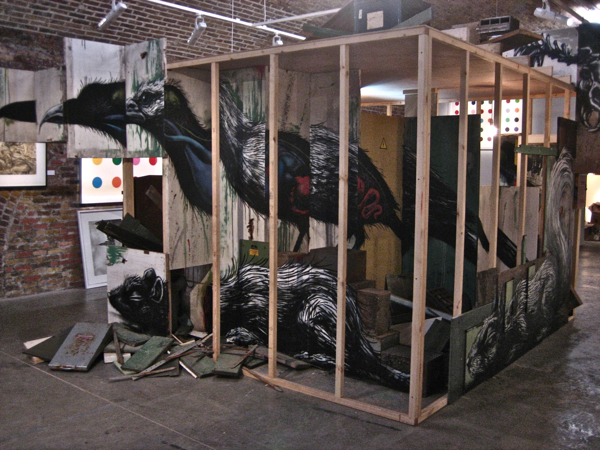 A grasp of the dramatic potential his works is one of the qualities that makes Roa such a superlative street artist. Naturally, there is a tension in the existence of these wild creatures in the cityscape, a tension amplified by their monstrous scale, but, beyond this, Roa knows how to place them. You walk up Hanbury St and the three storey heron appears around the corner. You walk down Redchurch St and the ten foot squirrel leaps out from Club Row. 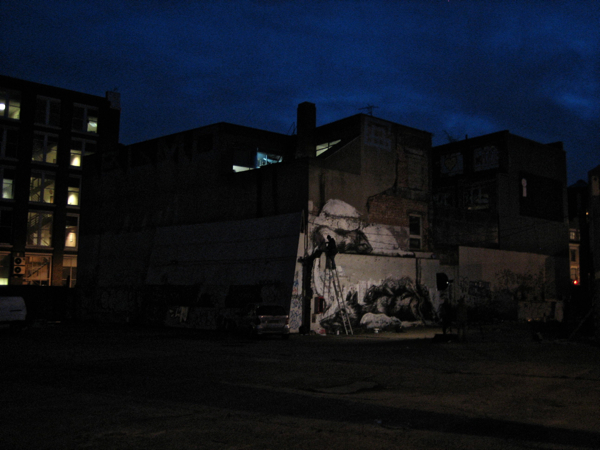 Here in Old St, the effect is more subtle since the painting is in a car park, but the tip of it is visible from the street which will draw people in to confront the whole thing. Most excitingly, commuters sitting on the top of the bus will have a jolt this morning to see this huge pile of sleeping animals, manifesting the somnolent state they might wish to return to, in preference to work, if they had the choice. For the last five years, Roa has been painting his animals on walls all over the world in response to a chain of invitations. He has only spent a few months in his home town of Ghent in the last year, and now has come to regard wherever he is engaged in the familiar act of painting as his home. 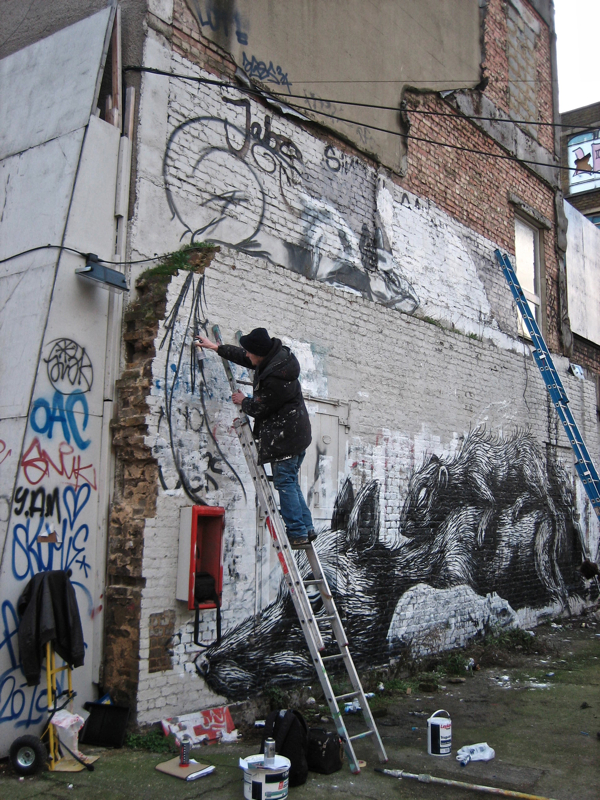 Roa makes a living but not a fortune, doing the projects he likes rather than those that pay. Mostly, he gets no monetary reward for his work at all and commonly, as at Old St, pays for the paint out of his own pocket too. “Even when the conditions are difficult, I really enjoy this,” Roa admitted to me, his eyes gleaming with delight, as we stood alone in the empty car park in the dusk, clutching hot drinks to keep warm. And after all this investment of care and energy, he is happy to walk away and leave his inspirational work out in the street, subject to the random nature of fate. 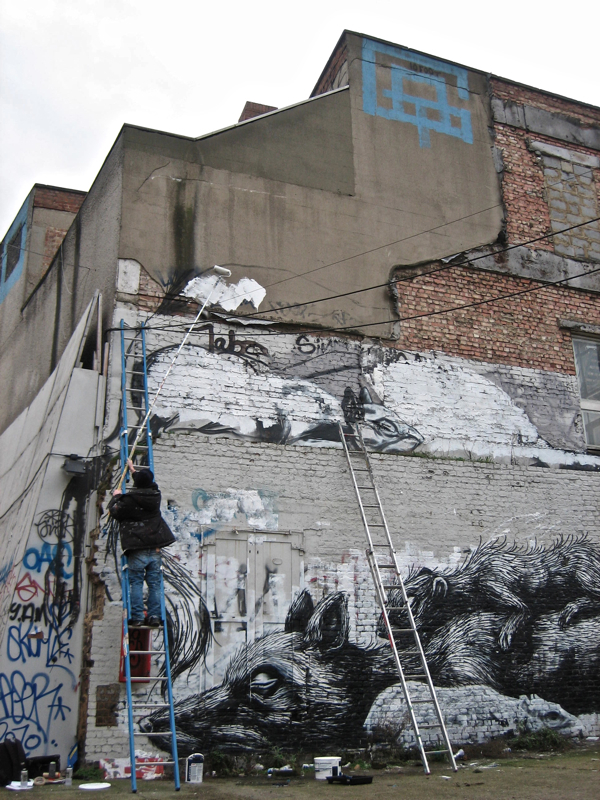 “That’s what I like about painting outside,” Roa explained to me, dismissing his own generosity of spirit, “It’s not something harassing you every day at home.” In a few days, Roa will be gone again like a migratory bird – leaving us the benefits of his life-affirming talent. 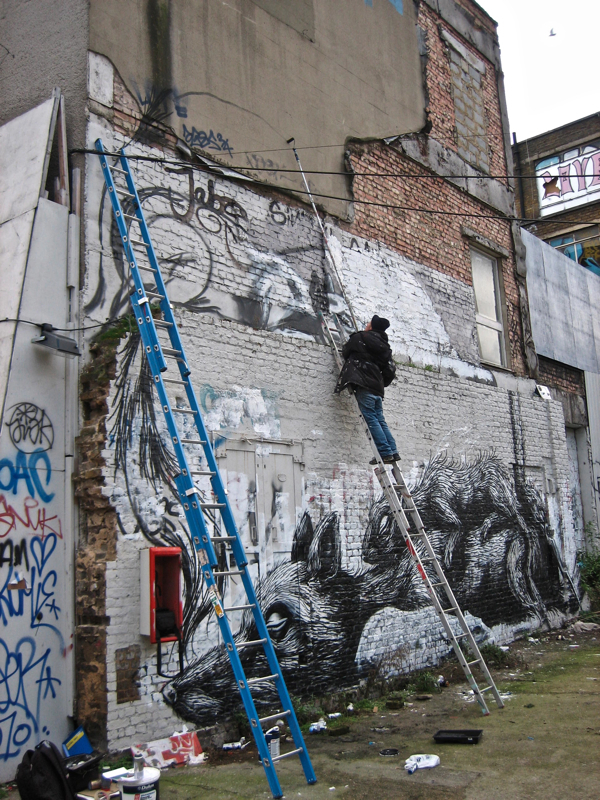 Roa begins his second day’s work on the Old St mural by sketching the hind quarters of a squirrel. Roa draws the squirrel’s ears. 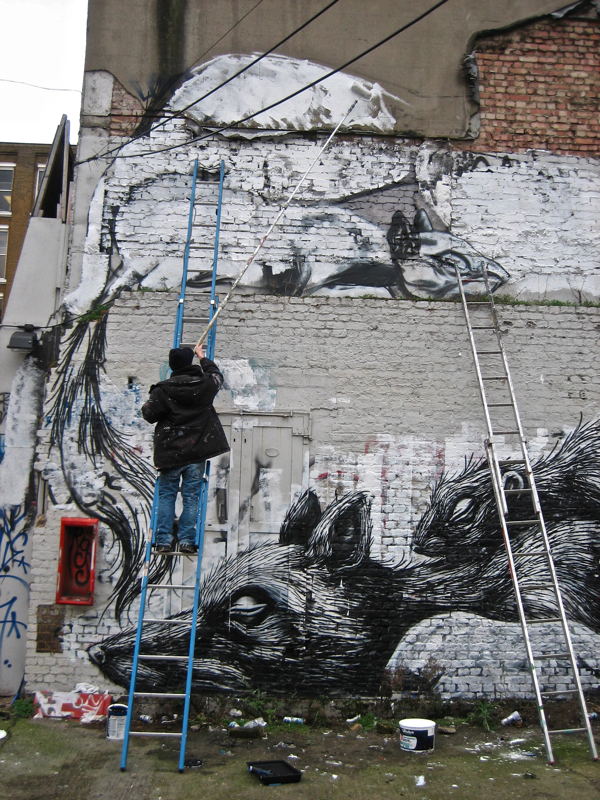 Roa draws the squirrel’s tail. 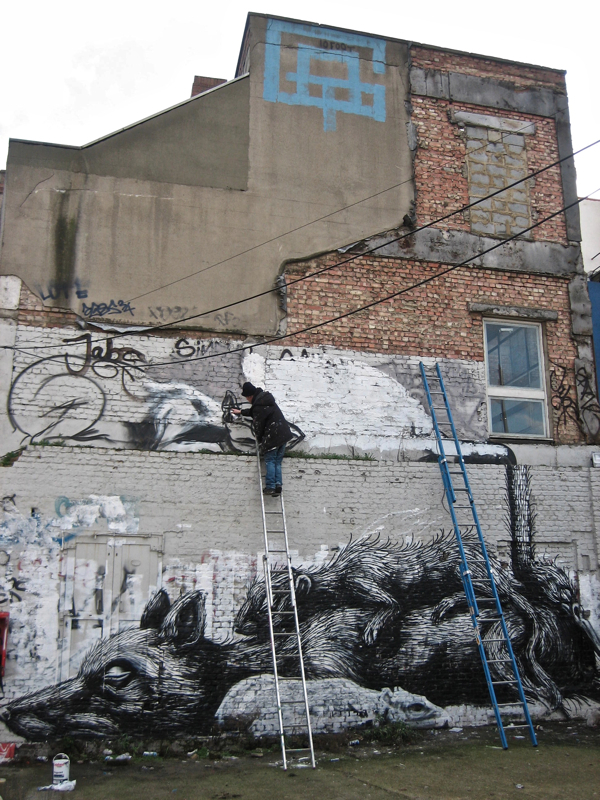 Roa draws the outline of the heron. 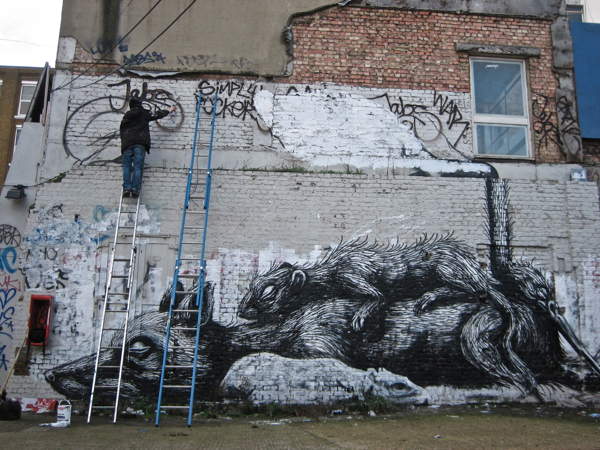 Roa paints the body of the heron. 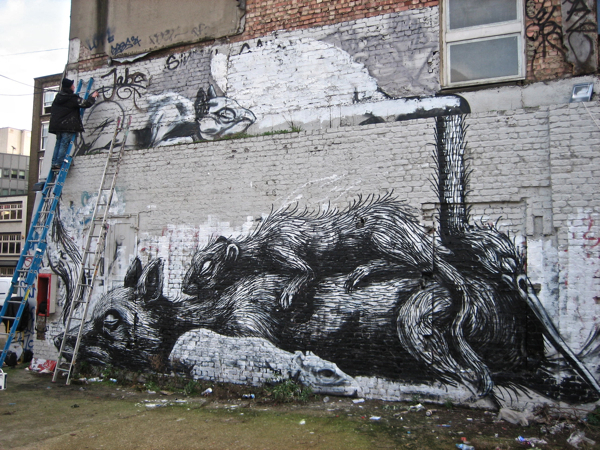 Roa paints the squirrel’s tail. 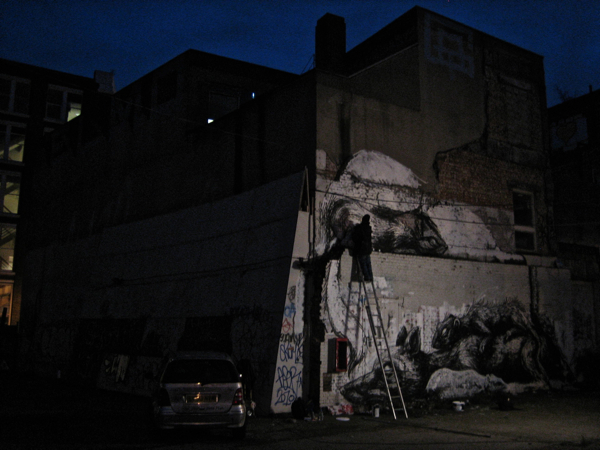 Roa works into the night on his squirrel. I love his work, it’s a joy. There’s something truly subversive about these wild creatures in the city, but in a very gentle way as they’re so beautifully drawn. Though that pile of animals is a little spooky! Thank you for publicising this new work – I shall make a journey to see it. He’s an absolute genius…had a fabulous time doing a walking tour of his pictures last year…glad he is back…and thanks for posting! A wonderful, totally inpirational account of somone who is doing what he loves, with joy , while powerfully transforming the urban landscape as well as making a profound statement. Wonderful stuff, I hope he is still around? People like this make me wish I could paint. I love his work! The scale of the animals is what makes it so special. There’s something simultaneously creepy and cute about them. So amazed at the ability and pure joy his talent puts in your heart. It must be pure joy for him after he looks at his finished work. Thank you!!!!! I caught a glimpse of this wonderful work today when the workmen had removed some of the current hoardings to replace them. Before the whole building is pulled down. So delighted to discover your record of the creation of this work. 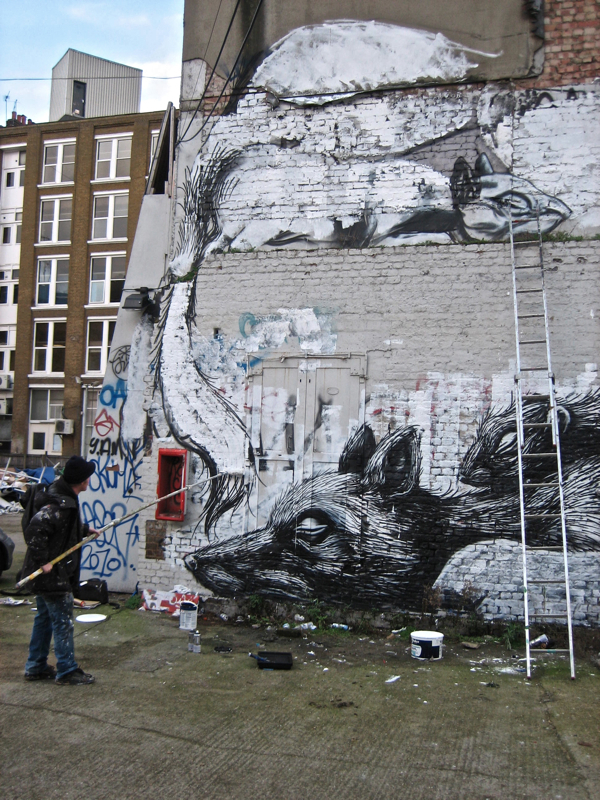 ROA is one of the iconic Shoredtich street artists for me.